Available Land: Lots Available Approx. 4.9 ha. Interpark Utsunomiya, Fujioka, Kaminokawa Town and others. Industrial district, Area planning is available. To enter into a Pollution Control Agreement based on the Tochigi Living Environment Preservation Act. To drain by public drainage after the processing ( BOD 600 mg./liter or less) by each company individually. Special high voltage (154kV): Available. 3 km, 5 minutes by car, from JR Suzumenomiya station on JR Utsunomiya Line. 8 km, 12 minutes by car, from JR Utsunomiya station on JR Utsunomiya Line or Tohoku Shinkansen. Next to New National Route 4, Utsunomiya-Kaminokawa interchange on Kitakanto Expressway. 4 km, 6 minutes by car, from Kaminokawa Town town hall. 8 km, 12 minutes by car, from Utsunomiya city hall. Enterprises newly establishing or transferring to Industrial Parks in the city, and in the industries designated by Utsunomiya City. 3% of the total acquired amount in related with the acquired land, newly established or transferred buildings, and equipment. 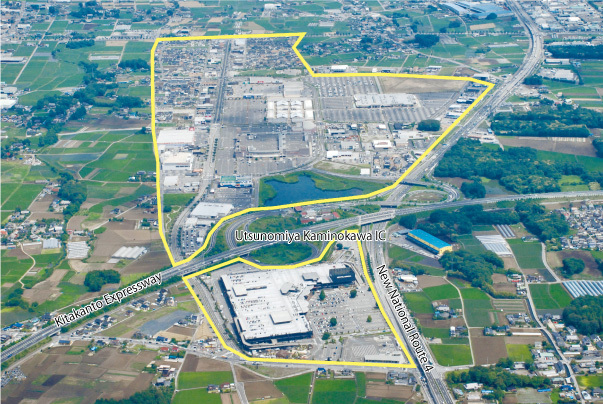 Enterprises, located in Interpark Utsunomiya Minami and Utsunomiya Technopolis Center, and in the industries designated by Utsunomiya City. Enterprises, making a relocation from the specific disaster areas to the area subject to this programs in Utsunomiya City, and in the industries designated by Utsunomiya City. 25% of a land acquisition cost and 3% of an equipment acquisition cost. Limit amount: 200 million yen in total with the basic portion of the subsidy. Enterprises, located in the city, and in the industries designated by Utsunomiya City (to be a large scaled establishment which the basic portion of the subsidy exceeding the limit amount of 100 million yen). Limit amount: 1 billion yen in total with the basic portion of the subsidy.